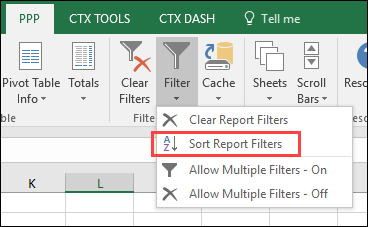 Use macros to quickly change the report filters in an Excel pivot table, or block filter changes. Download free workbooks to test the macros. In some pivot tables, you might want to prevent people from selecting the "(All)" option in a Report Filter. Use this macro to stop them from choosing that option. In this example, the worksheet has GetPivotData formulas that refer to a Report Filter cell. 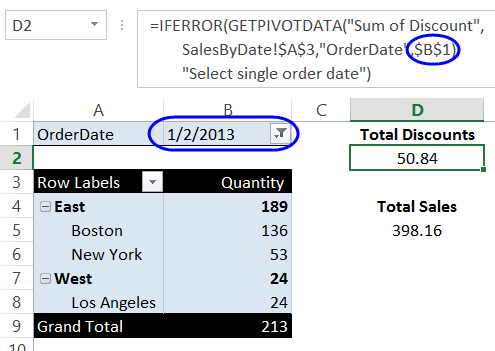 The formulas work correctly if an order date is selected in cell B1. If (All) is selected, the formulas show a message -- "Select single order date". You can't remove the (All) option from the report filter's drop-down list, but you can use a macro to prevent users from selecting that option. The code below, stored on the OrderDates sheet's module, can undo the report filter change, if (All) is selected or if multiple items are selected in the filter. The macro also shows a message warning -- "Please select a single date." When you select an item from a report filter's drop-down list, the PivotTableUpdate event is triggered. The code checks to see if the (All) item was selected. If it was, the code undoes the change to the report filter, and displays the previously selected item. To use this macro, copy the code below, and paste it onto the pivot table's worksheet code module. This code is also available in the Block (All) sample file that you can download. 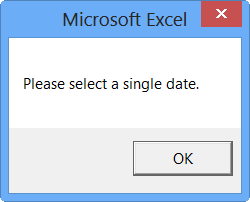 MsgBox "Please select a single date." When you click the drop down arrow on a Report Filter, you can select one or more items to view in the pivot table. In Excel 2010, and later versions, you can also use Slicers to select items from the Report Filter. If you don't have room for Slicers on your worksheet, add a Spin Button, to quickly scroll through the items in a Report Filter. To use this technique, follow these steps to add a Spin Button on the pivot table worksheet. Draw a short, wide Spin Button, near the Report Filter field. A Change event procedure is created for the Spin Button. From the drop down list at the top of the code window, select SpinDown, and then select SpinUp, to create two more events. If a Change procedure was created, you can delete it. Before you can test the Pivot Spinner button, copy the additional macros in the next section, and paste the into your workbook. Go to the Developer tab on the Ribbon, and click the Design Mode command, to exit Design Mode. Click the Up or Down arrow on the Spin Button, to scroll through the Report Filter items. NOTE: This will only change the first Report Filter, if there are multiple Report Filter fields. Copy the following macro code, and paste it into a regular code module in the workbook. There are two macros in the code -- PivotPageUp and PivotPageDown.
' Developed by Contextures Inc. This technique is based on the Pivot Table scrolling example, shown above. 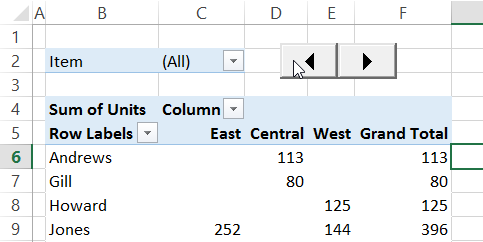 However, it also filters a column in the Excel table on which the pivot table is based. In this animated screen shot, the Product field is filtered, when the Spin Button arrows are clicked. This example is in the Download section below -- look for the sample named Pivot Spinner Table Filter. To set this up, follow all of the instructions in the Scroll Through Pivot Filter section, above. Then, add the following macro (ChangeFilter) to your workbook, in a regular code module. This code gets the name of the current item selected in the pivot table, and selects that item in the table's Product column. 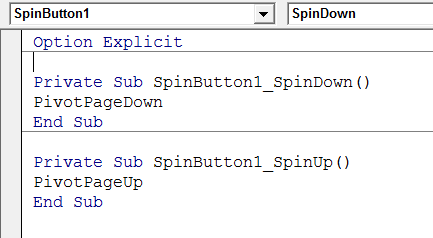 The final step is to add the ChangeFilter macro name to the Spin Button code. 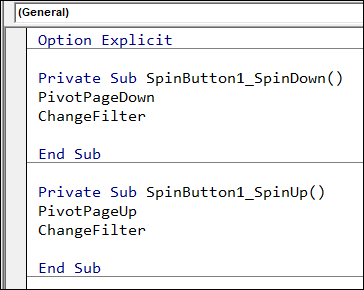 Type the ChangeFilter macro name in the SpinDown procedure, and in the SpinUp procedure. This macro prevents the pivot table data from disappearing, when the Report Filter selections are changed. There are related filters -- Quarters and Months. This technique could be used for other types of related filters, such as Category and Product, or Region and City. 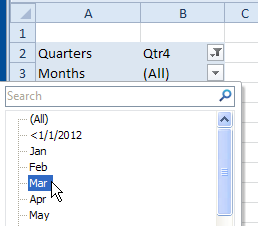 In this sample code, when you select a month from the report filter, the Quarters filter automatically changes, to show the quarter for the selected month. Otherwise, all the values might temporarily disappear from the pivot table, if the selected quarter did not match the selected month. If you select a different Quarter, the Months filter automatically changes to "(All)". To add this code to your workbook, copy the code below, and paste it onto your pivot table's worksheet code module. If necessary, change the field names in the code, to match the field names in your pivot table. MsgBox "Could not update fields"
There is a built-in pivot table command that will create a separate copy of the pivot table, for each item in a Report Filter field. This macro automates that command, and adds a prefix to each sheet's name. That makes the sheets easy to locate and delete later. In this example, a pivot table is on a worksheet named "SalesPivot". The "Rep" field is in the pivot table's Report Filter area. This macro creates a copy of the "SalesPivot" sheet for each Sales Rep whose name is included in the Rep field. The new sheet is named for the Sales Rep, with a "PT_" prefix. Then, in the pivot table on the new sheet, that sales rep's name is selected in the Report Filter. To use this code, copy it onto a regular code module in your workbook. Thc code is also available in the Sheet for Each Item sample file, in the download section below. MsgBox "Could not create sheets"
Sometime the items in a pivot field get out of alphabetical order -- usually if new items have been added to the data, and they appear at the end of the list. This macro will sort the items in each Report Filter. Note: If you have a copy of my Pivot Power Premium add-in, go to Filter, and click Sort Report Filters (see the screen shot below). That will sort all the Report Filter fields in all pivot tables on the active sheet. You can easily sort the pivot fields in the row or column areas, but there isn't a quick way to sort the report filter fields. With a few steps, you can manually sort the report filter fields, by moving them to the row area, and then moving them back. Block (All) -- Download the Block All sample file, which contains the pivot table and VBA code. The zipped file is in xlsm format, and contains macros. To test the code, enable macros when you open the file. 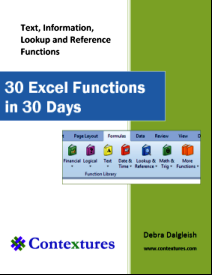 In the workbook, to see the code, right-click the OrderDates sheet tab, and click View Code. To test the code, select (All) from the OrderDate report filter's drop-down list. You should see the warning message. Pivot Spinner -- Download the Pivot Spinner sample file, which has a spin button to change the item selected in the Report Filter. The zipped file is in xlsm format, and contains macros. To test the code, enable macros when you open the file. In the workbook, to see the sheet code, right-click the SalesPivot sheet tab, and click View Code. Pivot Spinner Table Filter -- Download the Pivot Spinner Table Filter sample file, which has a spin button to change the item selected in the Report Filter, and that changes the filter applied in the worksheet table too. The zipped file is in xlsm format, and contains macros. To test the code, enable macros when you open the file. In the workbook, to see the sheet code, right-click the FoodSales sheet tab, and click View Code. Change Related Filter -- Download the Change Filters in Same Pivot Table sample file, which contains the pivot table and VBA code. The zipped file is in xlsm format, and contains macros. To test the code, enable macros when you open the file. 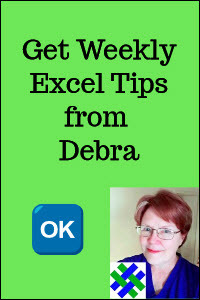 In the workbook, to see the code, right-click the pivot table's sheet tab, and click View Code. Sheet for Each Item -- Download the Pivot Sheet for Each Item sample file, which contains the pivot table and VBA code. The zipped file is in xlsm format, and contains macros. To test the code, enable macros when you open the file. The code is stored in a regular code module. 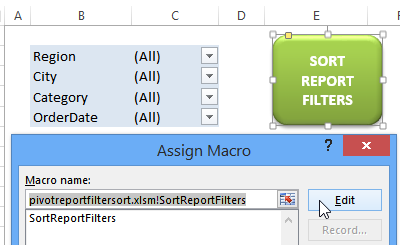 Sort Report Filters -- Download the Sort All Report Filter Fields sample file. To see the code, right-click the button on the Sales Pivot sheet, and click Assign Macro, then click Edit.